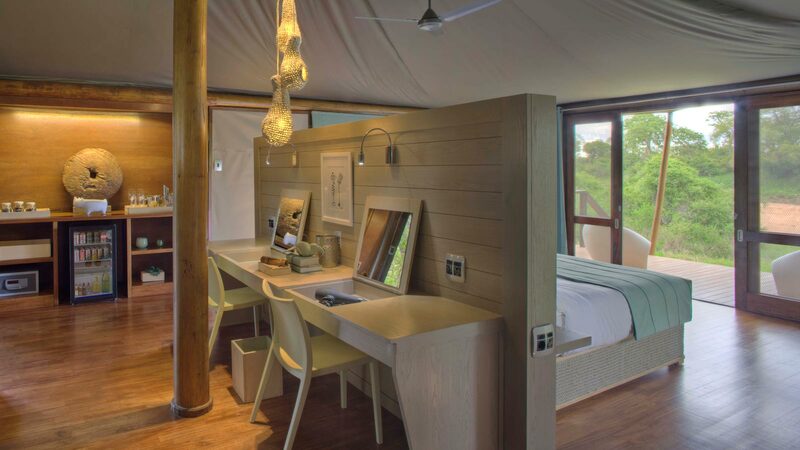 The romance of canvas, with big night sounds and flickering lanterns lighting the camp grounds, mingles with the simple sophistication of polished wooden decks, textured fabrics and clean lines. While Ngala Tented Camp never lets you forget that you are in the wild, there is nothing primitive about this chic and contemporary camp. Ngala is a true safari experience where you go to bed to the sounds of lion calling, safely cosseted in modern tented suites and pampered with the warm hearted service that embodies the soul of Africa. Caught between the dense riverine forest and the sandy bed of the Timbavati, extensive viewing decks give onto the river, giving guests a frontline view of game wandering down to drink. A rim flow pool mimicks the contours of the river bed, inviting in for a refreshing dip. Plush armchairs beguile you to spend a lazy afternoon idly gazing into the river bed. At night, when tales of the day’s adventure are shared and compared, a roaring fireplace springs to life. The stirring scents of Africa’s famous spices waft up from a meal shared in a spectacular setting – among islands or reeds in the dry Timbavati riverbed, beneath the canopy of massive trees or on our expansive deck. 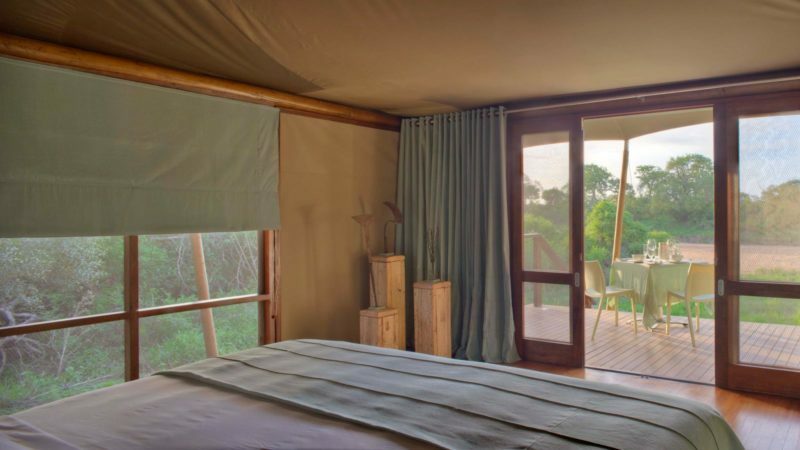 Chic and contemporary, Ngala Tented Camp is renowned for sophisticated tented accommodation in tranquil bush surrounds. 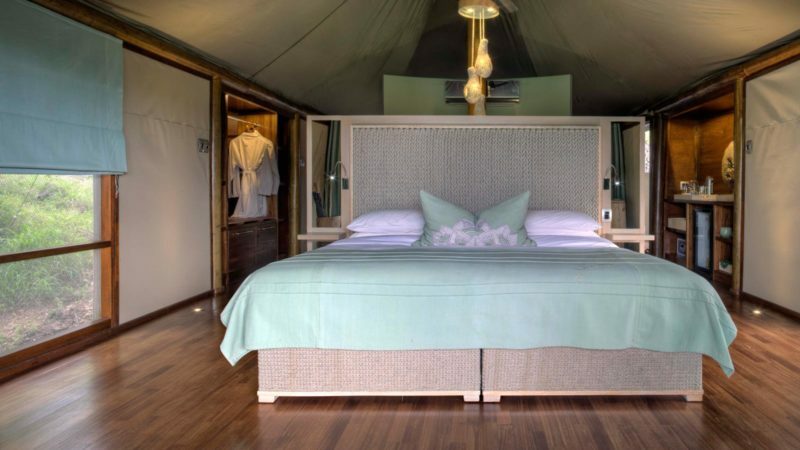 It comprises nine luxurious tented suites set on raised platforms with lovely ensuite bathrooms, swirling overhead fans, air conditioning, electric blankets for winter and private wooden decks. The overall essence is African, with warm, earthy tones used throughout. Built on platforms, each tented suite is cleverly designed to blend into the riverside trees, minimising impact on the environment. Mature indigenous shade trees form a luxuriantly cool canopy overhead and elegant guest areas overlook the seasonal Timbavati River. 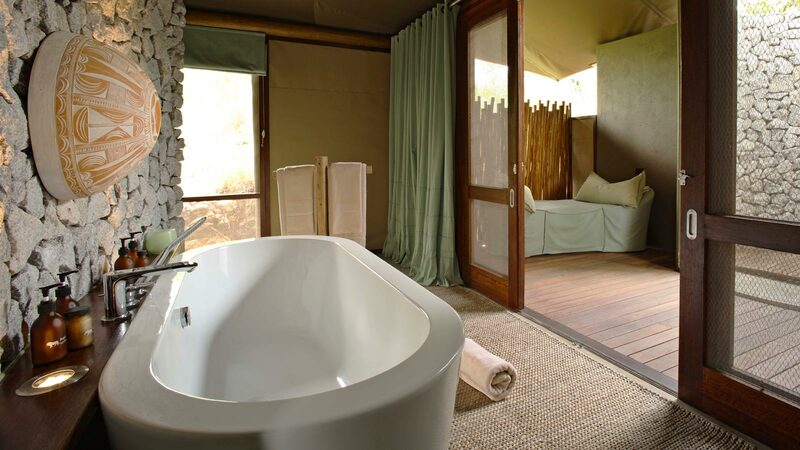 • Rates quoted are for Ngala Tented Camp. Other room type rates are available on request. 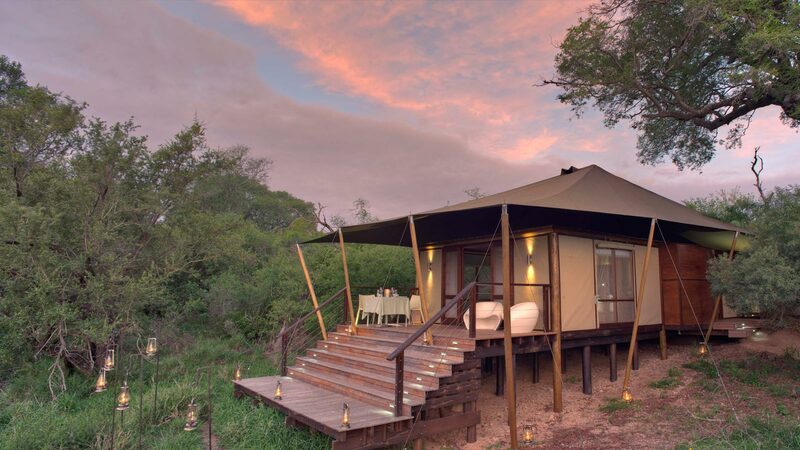 Ngala Tented Camp was the first private game reserve to be incorporated into the Kruger National Park and has exclusive traversing rights over 14 700 hectares of game-rich wilderness. The reserve offers an intimate African wildlife experience, with game drives led by expert ranger and tracker teams. Sensitive off-roading practices allow close-up game sightings, while walking safaris and bush walks are also offered. In one of Africa’s most innovative conservation partnership agreements, the annual lease, traversing fees and a percentage of Ngala’s profits are paid to the National Parks Trust to further conservation projects throughout South Africa.